Peter’s earned his night off, and there s not a bloody chance he’s covering Shelley’s shift. He just needs to find some pals for the perfect cover story. Deek is going to be at the forefront of the outsider art movement and do Banksy proud. Davie loves tattoos and his latest is going to be a masterpiece. Tam is one of the most creative minds in the galaxy (apparently), but creating parallel universes can cause problems. Everybody on Earth wakes up with their knees on backwards. 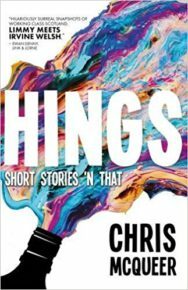 He caught folks imagination on Medium with his stories, had rooms howling with laughter on the spoken word circuit, and now it s time to put Chris McQueer on the page.